Every fall the Greek Orthodox Church of Salt Lake City holds a Greek Festival and every fall we go and have a great time feasting on the food and enjoying the Greek culture. 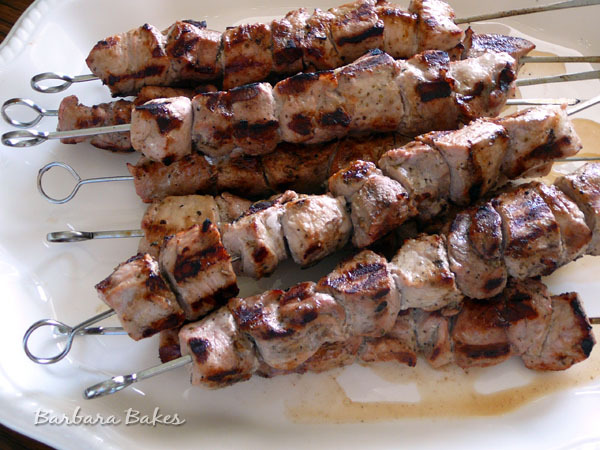 One of our favorite foods is the souvlaki – tasty little bits of juicy, marinated, barbecued pork. One year I decided having souvlaki just at the Greek Festival wasn’t enough, so I went in search of a great recipe I could make a home. It was probably more than 25 years ago, before I could just hop on the internet and find a great recipe, so I went to the library and in a little Greek cookbook found this souvlaki recipe that my family loves and I have been making frequently ever since. It’s easy and so delicious! I am submitting this family favorite recipe to the Family Recipes: Memories of Family, Food and Fun event hosted by HoneyB and Laura. I’m looking forward to the roundup of great family recipes everyone is willing to share. Mix ingredients, marinate in a Ziploc bag 6 hours or overnight. Spear cubes on skewers. BBQ on high heat approximately 3 minutes per side. Melt butter in sauce pan. Add rice and saute stirring frequently until rice is transparent. Add broth, salt and lemon juice. Bring to a boil. Cover pan, turn heat to lowest setting and simmer 25 min. or until rice is tender. « Previous PostThe first Daring Cooks’ challenge is … Ricotta Gnocchi! My recipe is similar for the Souvlaki; however, I use 2 cloves of garlic and oregano and bay leaf. I marinate the meat with quartered onions in a bag overnight in the fridge. Nummo. The rice sounds delicious. Hi Julie – sounds like delicious additions. Thanks! We tried this and it was amazing. Thanks for the recipe. Glad I found your blog. You have great stuff. Yum, this sounds really good and something I could make! That looks so yummy! I love tried and true recipes that you’ve been making for years and still keep making–that’s a sure sign of a great recipe! Yum, I love Greek food. If I can just get off my Paris food obsession I’ll try your recipes. The rice looks delish. I’m making this tonight. I’ll let you know how it turns out. I can’t wait. It should go over big with everyone, especially my son who loves pork chops and pork tenderloin. Dear Barbara, I expect an award on my blog! This sounds fantastic,and nice and easy too! I didn’t know it was pork either! I’m excited to try this! I love greek food, I could eat it every day and never get tired of it. This looks delicious. What a wonderfull entry! I love souvlaki. This is a perfect, perfect meal! I’ve always wanted to know how to make Greek rice too. Thanks for sharing these great recipes! This looks fabulous! And of course, there will be delightful food at the Ball. It is the Pond, after all. Both of these recipes sound wonderful. Simple and delicious! I will have to check these out when I have a chance. Your Souvlaki looks just like the Greek Festival great job.